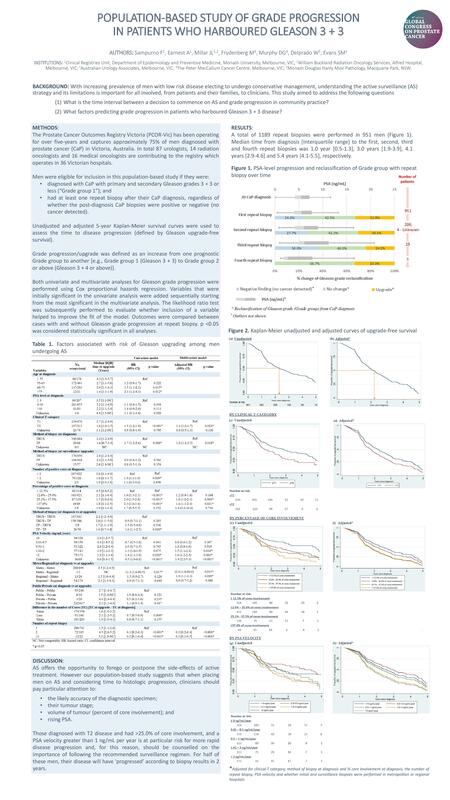 This study aimed to evaluate (1) the time interval between a decision to commence on active surveillance (AS) and grade progression in community practice; (2) factors predicting grade progression in localised prostate cancer (CaP) patients apparently undergoing AS. Data from the Prostate Cancer Outcomes Registry-Victoria were used to analyze men with Gleason 3 + 3 CaP or less who had at least one repeat biopsy. Unadjusted and adjusted 5-year Kaplan-Meier survival curves were used to assess the time to grade progression. Both univariate and multivariate analyses for grade progression were performed using Cox proportional hazards. The cohort included 951 men. Overall, 39% of men had Gleason grade reclassified to a higher risk disease state with median of 2.2 years [IQR 1.2-3.7 years]. Men who harboured cT2 disease were 30% more likely to have upgrading compared to men with cT1 disease (adjusted HR: 1.3, 95% CI 1.0-1.6, p = 0.048). Half of the men with cT2 in our cohort had their Gleason grade reclassified within 1.6 years from diagnosis as compared with 2.7 years for the cT1 group. The presence of percentage of core involvement >25.0% and a PSA velocity of >1.01 ng/mL/year remained significant for a higher progression rate. The adjusted HR: 1.6; 95% CI [1.2-2.3], p = 0.004; adjusted HR: 1.6, 95% CI [1.2-2.4], p = 0.021, for percent of core involvement of 25.1-37.5%, and ≥37.6%, respectively. The adjusted HRs and p value associated with PSA velocity were 1.5; 95% CI [1.1-2.1], p = 0.016 and 1.6; 95% CI [1.2-2.3], p = 0.003 for PSA velocity values of 1.01-2 ng/mL per year and >2 ng/mL per year, respectively. Men who were diagnosed in regional hospital and subsequently had biopsy in metropolitan hospital were twice at risk of having Gleason upgrade compared to those whom both diagnostic and surveillance biopsies were carried out in metropolitan hospitals (adjusted HR: 1.9; 95% CI 1.1-3.3, p = 0.029). When placing men on AS and considering time to histologic progression, clinicians should pay particular attention to the likely accuracy of the diagnostic specimen, their tumour stage, volume of tumour (percent of core involvement), and rising PSA. Those diagnosed with T2 disease and had >25.0% of core involvement, and a PSA velocity greater than 1 ng/mL per year is at particular risk for more rapid disease progression and, for this reason, should be counselled on the importance of following the recommended surveillance regimen. For half of these men, their disease will have 'progressed' according to biopsy results in 2 years.